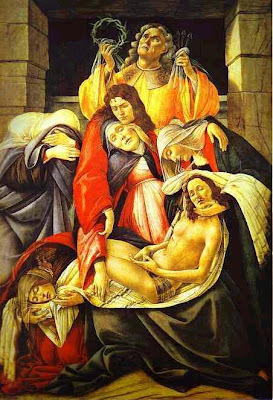 Today is Sabbatum Sanctum or Holy Saturday (the 'day of the entombed Christ,' is the Lord's day of rest, for on that day Christ's body lay in His tomb). Ideally, Holy Saturday should be the quietest day of the year; however, for most of us, it will be a busy day preparing for Easter (our family is also traveling to Owensboro, KY for our daughter's Bridal Shower and to celebrate Spring Birthdays). Nightfall on Holy Saturday is time for joy and greatest expectation because of the beautiful liturgy of the Easter Vigil (The Easter Vigil was restored to the liturgy in 1955, during the liturgical reform which preceded the Second Vatican Council – or so I've read). According to one source: We recall the Apostle's Creed which says "He descended unto the dead." It is a day of suspense between two worlds, that of darkness, sin and death, and that of the Resurrection and the restoration of the Light of the World. For this reason no divine services are held until the Easter Vigil at night. This day between Good Friday and Easter Day makes present to us the end of one world and the complete newness of the era of salvation inaugurated by the Resurrection of Christ. This, and the writing of several posts this week that highlighted Lewis, Clark, and Thomas Jefferson, reminded me of another Thomas Jefferson accomplishment: The Jefferson Bible. Here's a brief history: Making good on a promise to a friend to summarize his views on Christianity, Thomas Jefferson set to work with scissors, snipping out every miracle and inconsistency he could find in the New Testament Gospels of Matthew, Mark, Luke and John. Then, relying on his version of “Ctrl = X” and “Ctrl = V”, he a cut-and-pasted all the excerpts into what he believed was a more coherent narrative. He called the book "The Life and Morals of Jesus of Nazareth." Friends dubbed it the Jefferson Bible. As one historian asked, “Can you imagine the reaction if word got out that a president of the United States cut out Bible passages with scissors, glued them onto paper and said, 'I only believe these parts?'" What does all this have to do with Holy Saturday and Easter? 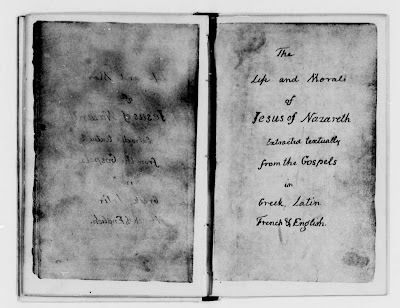 The Jefferson Bible begins with an account of Jesus’s birth without references to angels, genealogy, or prophecy. Miracles, references to the Trinity and the divinity of Jesus, and Jesus' resurrection are also absent from the Jefferson Bible. The work ends with the words: “Now, in the place where he was crucified, there was a garden; and in the garden a new sepulchre, wherein was never man yet laid. There laid they Jesus. And rolled a great stone to the door of the sepulchre, and departed.” These words correspond to the ending of John 19 in the Bible. Why did he leave out the resurrection? In an 1803 letter to Joseph Priestley, Jefferson stated that he wanted to begin with a review of the morals of the ancient philosophers, moving on to the ethics of the Jews, and concluding with the "principles of a pure deism" taught by Jesus, "omitting the question of his deity." Jefferson explained that he really doesn't have the time, and urged the task on Priestley as the person best equipped to accomplish the task. As did Jefferson, I'll leave the discussion of resurrection to those of you “best equipped to accomplish the task” For now, let me just wish you all a blessed Sabbatum Sanctum (Holy Saturday) and Easter. 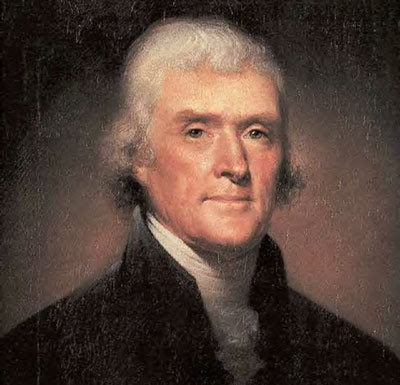 That's interesting, I am a big Jefferson fan, and have a half read TJ biog on my nightstand i must finish. Does that Bible still exist..... To View? always good for dipping into, and understanding, and thinking about. Yes, the book is still being published. It also appears that you can down load it for free on some sites. Holy Saturday! Yes, a time of joy and reflection in my life. I light my own holy fire and burn my palms from the year before with a list of things I want to let go of. I sort of New Year's celebration without the booze. Jefferson was a brilliant man. I can imagine his disgust in how some of his Americans have become so narrow minded and...well, basically stupid. Monticello is an amazing place. You get to see who advanced this man really was...but also how much he was also a man of his time with all its faults...like owning slaves. I don't recall seeing the actual Jefferson Bible there, but regardless, it is one place to put on your must see list.